Impression Mat Set of 4; Honeycomb, Weave, Eyelet & Lace. Impression Mat Set of 4; Sand, Waves, Cobblestone & Brick. 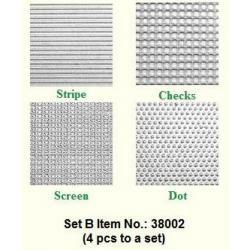 Impression Mat Set of 4; Strips, Checks, Screen & Dots.